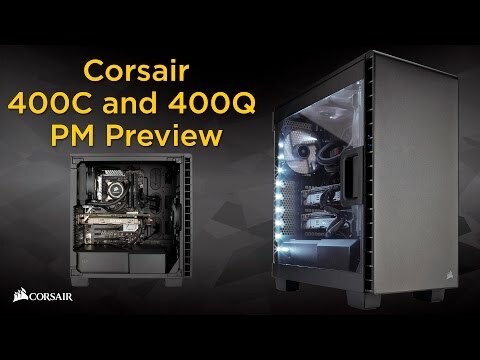 Corsair have engineered the Carbide Clear 400C to pack all the performance and expandability you need into a beautifully compact case design. Put your components on display through the gorgeous, full-size window panel that opens with a touch — and keep it all running cool and quiet with Direct Airflow technology. With a one-touch side panel, tool-free drive installation, and three-point dust filter access, 400C is easy to build and even easier to keep clean. You’ll spend less time on setup and maintenance, and more time enjoying your PC. Easily access your components with a single touch – and when it’s closed, enjoy viewing every part of your build through the full side panel window. Great airflow doesnft have to be noisy. The fans can push good amounts of air across your hottest devices with less distracting fan hum, and the direct airflow design of the 400C provides an excellent path for cold air to get to your hottest parts. This case comes with 2 fans included, at the front it hosts a 140mm AF140L fan and at the rear is a single 120mm fan. The 270R has room at the front, top, and rear for radiators, allowing you to quiet down your GPU and CPU with liquid coolers, this also allows you to get better overclocks out of your components for better quality gaming. 360mm: Front only / 280mm: Front only / 240mm: Front or Top / 120mm: Front, Top or Rear. Corsair Carbide Clear 400C Mid Tower Computer Chassis, White, ATX/Micro ATX/Mini ITX, With Side Window and USB 3.0 is rated 4.4 out of 5 by 5. Rated 5 out of 5 by BookOfGreg from Beautiful case, excellent side This case is beautiful, the side door is a simple hinge on pegs you can lift off for cleaning and it swings open wide easily, much better than screws at the back most have! Cable management was easy enough, only issue is my motherboard is taller than a standard ATX so could not keep the hard drive shroud but still looks fine without it. Had worries the front would be plasticky but its actually fully metal including front panel which surprised me! Great quality. Only minus is hard drive trays are hard to install, have to bend them to get the pegs in the drive. Rated 5 out of 5 by ORPHEUS from GREAT UP TO DATE PRODUCT Wonderfully user friendly case , fitting everything is easy , you can get at everything, like the fixed peg for fitting the mother board , makes it so much easier , the doors great , runs very quite , even with the cpu radiator fans on the top outside the case, solid well made case .THANKS. Rated 4 out of 5 by BobDiggler from Excellent case, looks great, but poor standard fans Always excellent service from Scan, got this case quickly. The case itself is excellent - plenty of ventilation headroom, wonderful opening glass side panel. The ease and ability to fit a front mounted 240 or 280 radiator is a massive plus. However, the only negative thing to state is that the standard corsair fans (1x 120mm & 1x 140mm) are extremely poor quality. They are loud and clicky/squeaky and look terrible - you will really need to swap these out for better third-party units. After the fans have been swapped out this is an excellent case that I would easily recommend. Rated 4 out of 5 by maonayze from 4 Stars and could have been 5 but..... This is a quality case with what can only be called a Windoor on it's left-hand side for you to show off your beautiful build. I am not a big fan of small windows in cases. Lets be honest...what is the point of only seeing a small part of something you have spent a lot of money and time on? With this case you get to see everything...so you had better make it clean, tidy and pretty...trust me it will be worth it. I loved building in this case as even for me (big hands and pork sausage fingers) there was enough room to get everything done without a fuss. The case is a midi-ATX and seemed small compared to my old full tower case but everything fitted in perfectly. The only issue I had was the cable tidying around the back where the SSD drive cages were, as I wanted white braided extensions to the motherboard to make the viewable side look just right. So I had to flatten down and route things a bit more than ever before. I wish you could have had three singularly releasable SSD cages instead of one set of three as i would have taken out the one nearest to the holes for the motherboard to make cable routing a bit easier. It would also have been easier if the case was about one inch wider to help with this too, but you cant have everything and it made me think and plan a bit more so that has got to be a good thing. Quality and Value are excellent as you have a cover for both the PSU and the 3.5 inch drive bays (which I am not using, so this has helped with cable hiding as they can be completely removed) and the build and paintwork are excellent. For the money this is probably the nicest case I have ever had and it looks amazing in white. So all in all I would have given 4.5 stars if I could have....a minor niggle with cable routing would have got it that extra half-star.